From Peking duck, to dumplings, throbbing dance floors, and trance at Beijing’s coolest bars and clubs – with a few inflatable pools. A beijing fun guide to nightlife as never before. LEGEND has it that the first Peking duck was roasted in 1416 at Beijing’s Bianyifang Kaoyadian (“Convenient to Everyone Roast Duck Restaurant”). The bird went on to put Beijing on the global gourmet map. But that’s just the beginning of the culinary delights awaiting visitors to the city. Along with the hearty local specialties, the capital attracts a host of regional Chinese cuisines and trendy international outposts from Russia to Peru and beyond. Add in Beijing’s characteristically laid-back vibe and friendly service, and this eclectic selection of dining rooms and funky lounges are sure to satisfy every appetite. Before we chase into the netherworld of Beijing nightlife, best to tickle the taste buds. And, of all the excellent Beijing dining experiences, the aforementioned Peking duck stands out as one worthy to bear the city’s name. You can still sample the roast duck pancakes in the restaurant that started it all – Bianyifang Kaoyadian, which now has 14 outlets around town. Our picks however are Liqun Roast Duck Restaurant (11 Beixiangfeng, Zhengyi Lu, northeast of Qianmen, Dongcheng District, tel: 6705-5578), a no-frills family-run joint located in a tumbledown hutong residence (follow the ducks painted on walls through the construction site), or the more upscale, and slightly less greasy Dadong (1-2/F, Nanxincang International Plaza, 22A Dongsishitiao, Dongcheng District, tel: 5169-0329). Siji Minfu (32 Dengshikou Xijie, Dongcheng district, tel: 6513-5141) does a brisk trade in affordable and tasty birds and has a cosy branch close to Qianmen. For deluxe duck, you can’t beat Duck de Chine (Courtyard 4, 1949 - The Hidden City, Gongti Bei Lu, Chaoyang District, tel: 6501-1949), which incorporates French culinary techniques and features a Bollinger Champagne Bar. Dongbei jiaozi, or northeastern-style dumplings, are another Beijing staple snack. You can see the thick wheat wrappers being swiftly folded around pork and cabbage fillings in eateries across the city, after which they are boiled and served with dark vinegar and chilli. For over 30 varieties of dumplings in hygienic surrounds, try Orient King of Dumplings (Bldg 14, Chaoyangmennei Nanxiaojie, tel: 6527-2042). If you prefer the more delicate southern siblings of the dongbei jiaozi, head to Din Tai Fung, which has four outlets in Beijing (6/F, Shin Kong Place, 87 Jianguo Lu, Chaoyang District, tel: 6533-1536). This legendary restaurant chain from Taiwan specialises in Shanghai-style xiaolongbao, steamed soup dumplings filled with minced pork and stock. 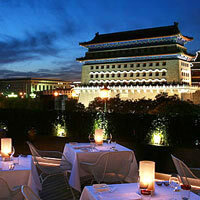 A highly refined form of Beijing’s traditional fare is Imperial cuisine, once served to emperors in the Forbidden City. The Li family, whose patriarch was a steward for the Qing Dynasty Imperial court, has passed down several secret royal recipes, which present-day generations of the family now cook for guests in their own humble home in a hutong near Houhai. Family Li’s Restaurant has just five tables and is booked months in advance for lunch and dinner, so reserve early (11 Yangfang Hutong, Deshengmennei Dajie, Xicheng District, tel: 6618-0107). Continuing with our Beijing dining sampler, moving beyond local dishes, Dali Courtyard (67 Xiaojingchang Hutong, Gulou Dongdajie, Dongcheng District, tel: 8404-1430) serves up a taste of the regional fare of China’s southern Yunnan province. 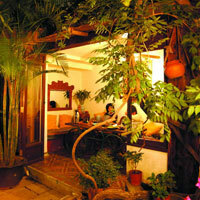 The alfresco courtyard charmer is hidden down a dark hutong near Nanluoguxiang. Set menus change monthly and include a deliciously spicy onslaught of barbecued meats, omelettes made from sheep-milk cheese, and rare highland mushroom dishes from the Himalayan foothills. Another regional Chinese restaurant worth seeking out is the bustling Qin Tang Fu from Shaanxi province (69 Chaoyangmen Nan Xiaojie, Chaoyang District, tel: 6559-8135). The menu has pictures and English translations, so be sure to point to the specialty pork burgers (la rou jia mo) and spicy flat noodles. Lan (4/F, LG Twin Towers, 12B Jianguomen Waidajie, Chaoyang District, tel: 5109-6012) serves up Sichuan spice in an über-hot setting. The kooky 5,000sq m restaurant and club designed by Philippe Starck, also has a seafood bar, 35 private rooms inside chandelier-strung Mongolian yurts and a moody lounge with eagle thrones and visiting DJs. You don’t have to be vegan to fall in love with Pure Lotus Vegetarian (inside Zhongguo Wenlianyuan, 12 Nongzhanguan Nanlu, Chaoyang District, tel: 6592-3627). Run by monks, this health-conscious vegetarian restaurant has a creative menu of healthy vegetable and mock meat dishes and heavenly presentations. 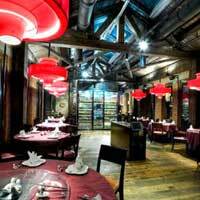 The Forbidden City area is a bit of a nightlife graveyard (Daniel Boulud famously closed his Maison Boulud at Ch’ienmen 23 in 2013), however, Brian McKenna @ The Courtyard (95 Donghuamen Avenue, Beijing East Gate of The Forbidden City, tel: 6526-8883) is a notable exception. The Irish chef is renowned for his eye-poppingly playful cuisine. Expect amusing diversions like a chocolate and mandarin flavoured dessert shaped in the form of a Terracotta Warrior kneeling in a pile of edible ‘dirt’. 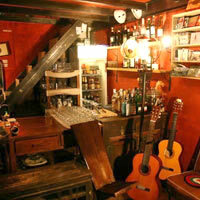 Just off Qianmen Pedestrian Street, Capital M (3/F, No. 2 Qianmen Pedestrian Street, Tian'anmen, tel: 6702-2727) is the first Beijing outpost for Australian restaurateur Michelle Garnaut, whose M on the Bund and Glamour Bar have long been Shanghai dining and drinking institutions. With Tiananmen Square as a stunning backdrop, the elegant eatery dishes up modern European food in a glamorous 140-seat dining room, Oval Room, cocktail bar and several terrace spaces. A cocktail on the terrace watching the sun set over the ancient fortifications is truly a capital experience. 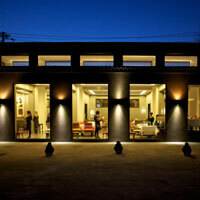 Hard to find but well worth the effort is Temple Restaurant Beijing, located within a 600-year-old Lama temple complex. The subtly renovated ancient temple buildings (check-out the centuries-old paintwork and Mao era revolutionary slogans) provide a stunning backdrop for one of Beijing’s hottest tables, created by former Maison Boulud general manager Ignace Lecleir. TRB’s finely executed menu of modern European creations (think: pot-roasted lobster with artichoke in white onion veloute) are paired with wines from the 200-bottle cellar. In another former temple (this time Taoist) behind the Bell Tower, follow the candlelit stairway to cosy, red-washed Zajia Bar (23 Doufuchi Hutong, Dongcheng District; tel: 8404-9141) adorned with shabby-chic clutter – from facemasks to vintage weighing scales. If you can’t find a seat at ground level, climb the staircase to the low lounges beneath the ancient rafters. Across the corridor, Zajia Lab is a tiny art space hosting some interesting performances and video screenings to an audience that perches on miniature wooden stools. Part of the same temple complex, but striking a different tone entirely, Contempio Temple Bar (tel: 6407-6778) commands an annex building accessed through a lantern strung gateway. A suave black-and-white bar leads through to a more evocative back-room lounge with crimson sofas and a baby grand piano. Our favourite spot though is the bamboo spiked courtyard with a fountain, swinging love-seats and views up to the carved eaves of the main temple building that stands deserted behind the bar. 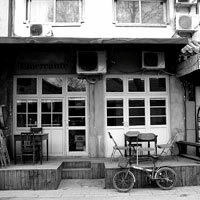 One of our favourite bars for a beer on a blue-sky Beijing day is the ultra-chilled Drum & Bell (41 Zhonglouwan Hutong, Dongcheng District, tel: 8403-3600). Head up the very steep wooden staircase to the adorable roof in the treetops with views of the historic Drum Tower and Bell Tower on either side. It’s a short walk from here through the hutongs to Café Sambal (43 Doufuchi Hutong, Dongcheng District, tel: 6400-4875), a charming Malaysian diner in a traditional courtyard dwelling. Seated at old wooden chairs in the open-air courtyard or cosy side chambers, diners tuck into modern Southeast Asian delights like kapitan chicken curry and chilli crab, washed down with good wines and cocktails. Mercante (4 Fangzhuanchang Hutong, Dongcheng District, tel: 8402-5098) is an authentic homestyle Italian trattoria transplanted into a mad Beijing hutong. It has just a handful of tables, including two on the raised streetside balcony where you can sip a Spritz and watch the passing parade of colourful neighbourhood characters. Book ahead or be prepared to wait for a table. You’ll be glad you did when you dive into lovingly prepared classics like homemade ricotta with celery and rabbit ragu over fresh pappardelle. The new APM store in the Wangfujing tourist and hutong district is always buzzing with a host of stores and affordable restaurants inside like the local dumpling favourite, Shun Yi Fu. 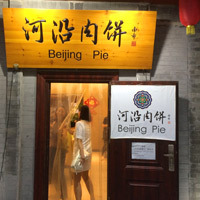 Not far from here in a hutong side street is another popular eatery with Northern Chinese fare at reasonable prices, Beijing Pie (No.159-2 Beiheyan Main Street, tel: 6528-2187). Much of Beijing’s nightlife action happens in the western Sanlitun area. Nali Patio is a Mediterranean styled hacienda chock full of groovy brasseries, bars and boutiques with a strong Spanish flavour. In the warmer months, the sprawling rooftop at Migas (6/F, Nali Patio, 81 Sanlitun Lu Chaoyang district, tel: 5208-6061) is a hip place to drape on sunken lounges enjoying live DJ beats. When it gets really hot they bring out the inflatable swimming pools. The party moves inside to the industrial-chic indoor bar during the colder months. Also at Nali Patio, Agua (4/F, tel; 5208 6030) is a refined Spanish restaurant by talented Catalan chef Jordi Valles with seasonal menus (think: slow-cooked Wagyu veal cheek with marinated plums and beetroot salad), classy Aperitivo hours, and great weekend brunches. Mosto (3/F, tel: 5208 6030) serves up contemporary South American paired with a good wine selection, while Enoterra (4/F, tel: 5208-6076) is a well-stocked wine bar with merlot-hued lounge chairs for relaxed quaffing. Refuel at hip java joint, Moka Bros (G/F, tel: 5208-6079) downstairs. A stone’s throw from Nali Patio, Alameda (Sanlitun Houjie, beside Nali Patio, Chaoyang District, tel: 6417-8084) is a sunny Brazilian with great steaks, feijoada on Saturdays and a well-priced lunch rapido. Follow the well-heeled party crowds through a non-descript carpark to Janes & Hooch (4 Gongti Bei Lu (diagonally across from Q Mex), Chaoyang District, tel: 6503-2757). At this glamorous, retro-styled saloon, besuited bartenders pour carefully mixed cocktails into art deco tumblers. The low-lit double-storey space is adorned with backlit bars, bagged brick walls and aged leather sofas. If only they’d turn the music down a bit to suit the oh-so-chic vibe. Staying in Chaoyang District, Hatsune (2/F, Heqiao Building C, 8A Guanghua Lu, Chaoyang District, tel: 6581-3939) rolls Japanese fare with a Californian twist. For a top-end Beijing bar tipple, head to Face (26 Dongcaoyuan, Gongti Nanlu, Chaoyang District, tel: 6551-6788), a seductive Indo-Chinese bar in an old middle school with sophisticated cocktails, opium beds and a walled garden. The Tree (43 Sanlitun Beijie, behind Poachers Inn, Chaoyang District, tel: 6415-1954) is a friendly pub behind the old Sanlitun North bar street, with excellent Belgian beers and thin-crust pizzas. For top of the city dining, head to China Grill on the 66th floor of the Park Hyatt (2 Jianguomenwai Lu, Chaoyang District, tel: 8567-1234). One of Beijing’s highest restaurants offers 360-degree views and a mix-and-match menu of both Chinese and international dishes, from Boston lobster to Australian Wagyu and pot-sticker dumplings. Save room for the to-die-for dessert platter. Stay on to party at Park Hyatt’s multi-concept nightlife venue, Xiu (6/F, Beijing Yintai Centre, 2 Jianguomenwei Street, Chaoyang District, tel: 8567 1838). This popular party palace features a spectacular sixth-floor open terrace offering views across the CBD, themed club nights and a heaving dance floor. Beijing’s live music scene is centred around Gulou, the ancient Drum Tower district. Music aficionados congregate at voguish Yugong Yishan (West Courtyard, 3-2 Zhangzizhong Lu, Gulou, tel: 6404-2711) or in the MAO Livehouse bunker (111 Gulou Dongdajie, Dongcheng District, tel: 6402-5080), which hosts a regular line-up of underground punk, indie, metal and rock bands. Descend to the Dada basement (206 Gulou Dong Dajie (below Temple Bar), Dongcheng District, tel: 183 1108 0818) for some of Beijing’s best alternative and electronic music, from bass to skweee, psytrance, cold wave and more. Rock on Beijing, rock on.